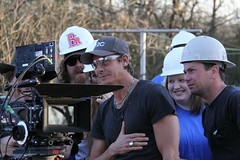 So it has taken me about a week to write the final installment in my experience with the Extreme Makeover Home Edition Big Hearts Build. When then limo pulled up with the Sharrock family and we all shouted Move That Bus, it was pretty emotional. The family was so happy and had such huge smiles on their faces that it just rocks you to your core. It was such an unbelievable 7 days! If you are ever able to volunteer for EMHE, do it! It is such a rewarding experience. I got back on Friday and it felt like I’d only been gone a couple of hours. Oh wait; it had only been a couple of hours. Not a lot has changed to the naked eye. Most of the work being done today it detail work inside and exterior landscaping. I wasn’t able to get very many photos today. 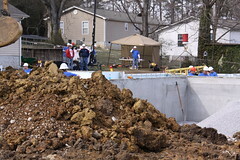 You couldn’t walk across the front of the house because they were finishing up the concrete work, you couldn’t walk across the back of the house because they were finishing the retaining wall and installing pavers, so that left inside and people were literally climbing over each other. I got a couple of shots of the general site. Pretty much at this point, I am so tired that I could not concentrate to get creative photos. February 17th to Februay 18th. This photo pretty much sums up the whole day for me. I did not leave until 3:30am on Friday morning and had been on site off and on for 14hrs. 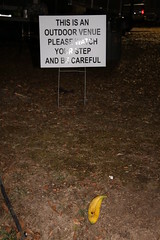 This was the last thing that we saw when we were walking from the site and it struck me as hilarious and cartoonish like someone would walk by and slip on a banana peel. I don’t have a whole lot of pictures from today/tonight because I was mostly getting pictures of some of the vendors who were installing equipment. I got onsite Wednesday morning (Day 4) at 5:00am! Yes, you heard me. 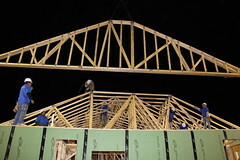 I was freaking out with excitement when I saw the framing had been done and the final trusses were going up. I have been there since the beginning, but it was kind of emotional to see a house being built as the sun was rising. I am so lucky to be part of a company that sees value in the community and them allowing me to be a part of this effort to give an ever lasting gift to a very special family. So on day 3, which was Tuesday, there was a lot of earth being moved. I got to the site expecting a house, but the previous night’s grading provided some water & sewer challenges. They were still bringing in the pre-fabricated foundation walls. Even though it seemed like things were moving at a snail’s pace; there were so many people there to support the builders, volunteers, and the family. I only stayed a couple of hours so I did not get that many pictures. Happy Valentine’s Day Ty! Thanks for having a great heart and spending it with us in Northwest Georgia. 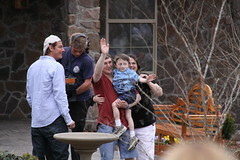 Ty was on site staging a scene with some volunteers. This photo was of him and the producers reviewing the clip. It was day two of the build and I missed the demo of the house, but there was still plenty of activity around the cleanup of all the debris. I tried to get more photos of the general area that it encompasses. It is really hard to imagine everything that is going on at one time. Click on the photos to be taken to my flickr page with all the pictures from today. I got to the site at about 4:00pm and packed up to go home at about 9:30pm. Hello Sharrock Family of Rossville! 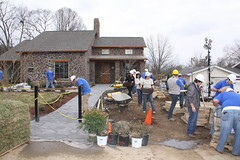 So Extreme Makeover Home Edition rolled into Chattanooga, TN to surprise the Sharrock family of Rossville, GA with an Extreme Makeover. I arrived on site Sunday around 7:00pm. EM Security had control of entrance points. Heavy equipment was on site and there was already so much work that had been done. The family’s belongings were being packed up into a moving van for storage and there rest of the things in the house were put into a dumptser. Literally, everything had to come out to get ready for the demo tomorrow. The utility companies were there in full force cutting power to the house, running temporary power, running a gas line, cutting the water to the house and getting ready for a new water meter. At night the place will be light up like a football field. The neighbors were offered hotel rooms for the week, but several stayed so they could be apart of the excitement. I’ll post more later. On the first night, I was there from 7:00pm to 10:30pm. 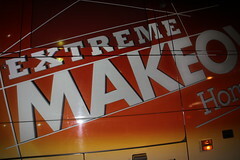 Thursday night Extreme Makeover Home Edition descended upon the Chattanooga area. 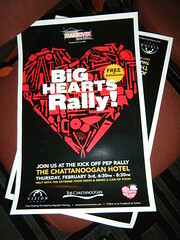 ABC Network, Vision Homes, and local businesses hosted the Big Hearts pep rally. More to come as this unfolds. This is the story of Ruby as I am telling it. She was born in the early 1900’s. She was a vibrant lady full of vigor and ingenuity. She lived into her 90s and was pretty much hell on wheels. Ruby never married nor had any children, although it is known that she had male suitors. Instead of settling down and living the life that society dictated, she lived her life only as Ruby wanted to live it. She had many business endeavors and travelled all over the country. She never lacked in a full life. So that moral of the story is that if you are feeling down and blue, just remember that Ruby persevered through life and came out a shining Ruby on top of the sundae of life! 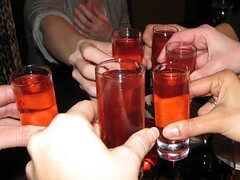 To Ruby! This is totally not pug related, but instead a big Happy 40th Birthday wish to my BFF Laurie! 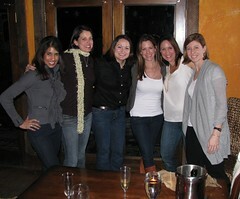 We all met up in the ATL to celebrate her turning the BIG 4-0! And if I must say, she makes 40 look great. Here is a recap of the night: we start out at Jennifer’s by popping a bottle of Champaign and toasting to Laurie and to the fact that all of us got together in one town to celebrate. We go to the Warren for some delish food and spirits. There are many glasses raised to Laurie and Ruby (the story of Ruby will be in another post). The night gives way to dancing; there is a photo of the DJ somewhere in the photos. We close the place down and attempt to walk down the street for breakfast. Mind you it is freezing cold and snow is still on the sidewalks. Unfortunately we don’t get to eat breakfast because Laurie lost her purse. We are canvassing the area in the middle of the night. Someone has the bright idea to call her phone. Two completely honest people found her purse and we meet up with them to retrieve it-thank you to the two guys who were just visiting Atlanta! We get back to Jennifer’s house. Someone spills a glass of wine on Jennifer’s couch and comforter. Thankfully it wasn’t’ me. We all wake up to review the photos and it was very similar to “The Hangover” except in Atlanta with girls! I will confess that the great thing about it being your camera is that you can delete any photos that you want. So even though I and random other people took about 190 photos and 10 videos. We had a lot of photos of the floor, someone’s hand, the ceiling, people with crazy eyes, etc. so only part of them were appropriate for public viewing. Laurie-you are so wonderful and I can’t wait to party with you on your 50th!!! You are currently browsing the archives for the Not pug related category.